Colorados adult obesity levels recently jumped at the second-fastest rate in the country, a disturbing increase for a state that has long bragged of being the leanest in the nation. Its not good news. If anything, its even more of a wake-up call. One of the things we know about obesity is its much easier to prevent than to reverse it. Weve got the opportunity to use prevention in Colorado. Were going to rapidly lose that, said James O. Hill, director of the Colorado Center for Health and Wellness at the University of Colorado Anschutz Medical Campus. The Colorado Health Foundation today released the 2011 Colorado Health Report Card. It found that for the first time ever, one out of every five Colorado adults is now obese. While Colorado remains the leanest state in the nation, our current obesity rates would have made us the fattest in the country in 1995. Source: Centers for Disease Control. Obesity defined as BMI over 30%. An analysis of adult obesity data by the I-News Networkfound a divided state with obesity levels spiking in low-income areas of the eastern plains and southern Colorado while wealthier mountain resort communities post the lowest obesity levels in Colorado. On the plains, nearly one-in-three adults is now obese while in the western part of the state, the rate is half that. There, about one-in-six adults is obese, meaning they have a body mass index over 30. The cost of rising obesity is steep to individuals, employers and the state as a whole. A new study published earlier this year in the journal Obesity found that Colorado spent $1.67 billion on obesity-related costs in 2009. The research team analyzed medical costs in all 50 states, then estimated the portion of costs linked to obesity. Rising obesity rates are having a big impact on Colorados health costs, said Emily King, a research analyst with the Colorado Health Institute, which conducted the research and analysis for the Colorado Health Report Card. King quantifies $1.67 billion by noting that it would buy five iPads for ever Denver resident. Its twice as big as the number of Facebook users worldwide, and that many people would fill every major sports arena in Denver approximately 10,000 times, she said. Solutions reported last year that Colorados child obesity rate was the second-fastest growing in the nation. In 2007, Colorado had the third-lowest child obesity rate in the U.S. In the most recent survey, Colorado ranks 23rd in the nation for child obesity. From 2009 to 2010, according to the CDCs Preventions Behavioral Risk Faction Surveillance System,Colorados obesity rate grew from 19 percent to 21.4 percent. That marked a one-year increase of 12.6 percent. Only Oregon, another traditionally lean state, fared worse, posting a one-year increase of 16.9 percent. Hill and others cautioned not to read too much into a single year jump. Whats more, Hill said its not surprising that lean states could see faster rates of growth in obesity levels compared to states like Mississippi, where much of the population is already overweight or obese. Experts dont know specifically why Colorados obesity rates have climbed recently and whether they will continue to increase at the same pace. Its likely that children who have weight problems and dont get help grow up to become obese adults. Everyone agrees the trend line is bad. Things are going to continue to get worse until we can get a better understanding of the causes of obesity and solutions that work, Hill said. Its going to take something big to make a serious dent in these high obesity rates. Somehow people dont perceive this as a crisis. This is a crisis and we have to get together to solve it, he said. The Colorado Health Foundation alone invested more than $37 million in Colorado nonprofits in 2011 to support its goal of making Colorado the healthiest state in the nation. Among recent anti-obesity victories, the Health Foundation cited the 2011 passage of HB 11-1069, which requires physical activity for all Colorado elementary students, along with LiveWell Colorados anti-obesity programs in 22 communities across the state. The Health Foundation pushes healthy snacks and meals in schools through support for LiveWells Culinary Boot Camps, which teach cafeteria workers to prepare healthy, fresh school meals. The purpose of the Health Report Card is to monitor trends over time and to serve as a call to action, said Kelly Dunkin, vice president of philanthropy for the Colorado Health Foundation. The foundation launched its Healthy Living investments in 2009. Reversing unhealthy trends, including Colorados rising obesity rates, will take time, she said. This obesity epidemic hasnt occurred overnight, and the reasons are multi-faceted and complex, including individual choices such as a sedentary lifestyle and poor nutrition choices as well as external influences, such as socioeconomic factors, access, the environment, policies and culture, Dunkin said. The bottom line, said Hill, is that efforts so far havent shocked people into changing bad habits. Were doing a lot of good things, but theyre not having a huge impact. In order to reverse the obesity epidemic, Hill said policymakers both in Colorado and across the country are going to have to come up with much bigger, more comprehensive solutions. Even if the U.S. established taxes on sugary beverages and could dramatically cut fast-food intake, the forces of supersized, high-fat meals and well-financed, snack food giants are conspiring perfectly with Americans increasingly sedentary lifestyles to make us fatter and fatter. Hill said obesity may be a more intractable challenge than cutting cigarette use. Colorado’s mountain communities boasted much better obesity rates than other parts of the state. Here, a resident of Grand County hikes to work. The Winter Park Ski Area is in the background. Photo by Diane Carman. Obesity is much more complex. With smoking, we know what to do. We help people quit. With obesity, so few things have worked, Hill said. Maybe it has to get worse. If kids started dying of heart attacks, people would say, Oh my God. This is something thats preventable. In terms of a big solution, Hill thinks Colorado could start by becoming the first state in the country to start reducing obesity levels. The I-News analysis found only one Colorado locale where obesity rates are actually going down: Arapahoe County. There, the obesity rate has fallen markedly from above the state average in 2006 to below the state the state average in the latest survey. The most recent rate was 17.7 percent down from 20.3 percent in 2006. 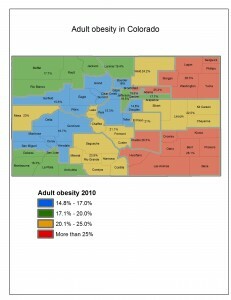 Health experts dont know why obesity levels are falling in Arapahoe County, which boasts a highly diverse population. But they all say its worth studying to see if the trend can be replicated elsewhere. Maybe there is something happening in Arapahoe County that no one has picked up on yet, Hill said. Burt Hubbard of I-News Networkand Nancy Mitchell of Education News Colorado contributed to this report.